Kris Kristofferson @ Ram's Head On Stage, Washington DC - Aug 5, 2013. At age 77, Kris Kristofferson is still touring. I saw John Mayall at the same age, and the most intriguing difference between these sets is that Kristofferson does not have any band to help him on stage. It is just himself with voice, acoustic guitar, and the occasional harmonica. The most important ingredient is his vast songbook filled with timeless classics, intelligent lyrics, and catchy country folk tunes. The sold-out crowd looked like they had been following him for a long time and unless you have lived in your personal Siberia, it would be hard not to know his music and style. The main question you want answered when an older legend comes to town is can he still deliver? I have rarely answered no when I see the legends and am happy to give a positive report tonight. Yes, the voice is old and quivering at times, but still quite expressive. The guitar playing is solid with the lightly picked tunes standing out as an edge-of-your-seat accompaniment to the storytelling in the songs. He gets full credit for doing his show solo with no one to fall back on. The mistakes such as having the wrong harmonica and occasional lyrical or guitar flubs were handled with charm and humor and there were not that many of them to matter anyway. He brought out "Bobbie McGee" early in the set and it was good for me to hear the originator perform this after hearing it a couple of times in the play "One Night with Janis Joplin". Quote of the Night: "You like to spend a lot of money to see an old fart blow his nose?" He surprised me by banging out so many short songs in his set that it seemed more like a Ramones set lists. No long pauses or stage patter, just a quip now an then and a nice technique of commenting between lyrics, such as the lint 'I don't care what's right or wrong' or rolling his eyes at a lyric and saying how much younger he was then or that it was a true story. If you want the best versions of these songs, stay at home with your records, but if you want a warm night out with grandfatherly-like storytelling within profoundly original songs, then head out to the clubs. 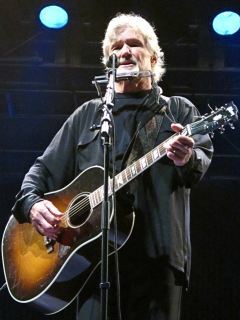 Photo Credits: (1) Kris Kristofferson (by Wikipedia).